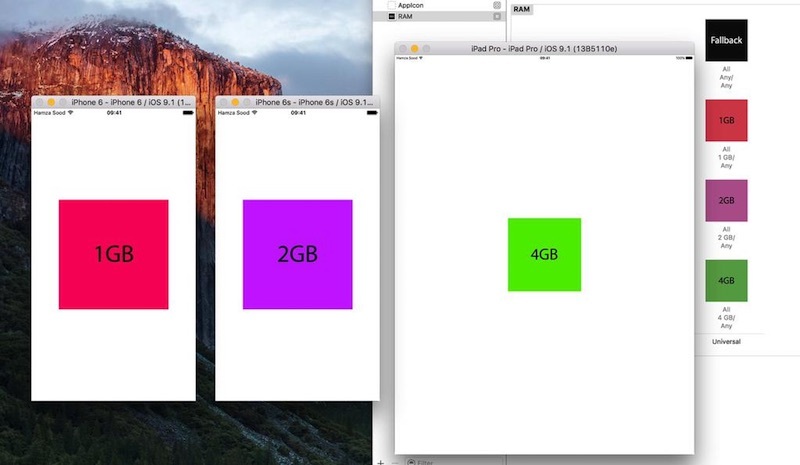 Apple development tool Xcode seemingly confirms the iPhone 6s and iPhone 6s Plus each have 2GB of RAM, while the iPad Pro has 4GB of RAM, as discovered by iOS developer Hamza Sood. The iPhone 6s and iPhone 6s Plus have long been rumored to have 2GB of RAM. Meanwhile, Adobe issued a Creative Cloud press release earlier this week that stated the iPad Pro had 4GB of RAM, but removed the mention just hours later. As usual, Apple itself did not mention how much RAM the iPhone 6s, iPhone 6s Plus or iPad Pro have during its "Hey Siri" media event, nor does it include RAM on the tech spec pages for any of the devices. Yuck, 1 GB of RAM is plenty. Hopefully they go back to 1 GB next year. Keep in mind, before the "wowz it took soon long" wave comes in, this 2GB of RAM is going outperform many/most of the 3GB+ devices out there. The amount of work they've done in memory compression (acquiring firms like anobit) and tuning the OS to the hardware is just staggering. Still not gonna believe until Taylor confirms it. Why is Apple so secretive about RAM? It makes no sense to me. Everyone finds out anyway; they may as well just list it in the specs. Please leave the area immediately or we will have to call troll security. Way to go, Apple! This is great news! The iPad Pro is just one more step towards iOS replacing Mac OS X. Sorry, not until it has a decent file system. 2 GB is a significant upgrade. On iPhone 6 (Plus) you only get a few hundred MBs of free RAM (200-300 at best). That's enough for a couple of tabs in Safari and 1-2 apps before things start reloading. With 2 GB RAM, you have 1.3 GB of free RAM (4.5x or 450% more) which is PLENTY for dozens of tabs and apps. A huge difference. Should have been 2 GB in the first place. The way apps refresh is my number one dislike of my 6+. It is beyond frustrating to type something in one app, multitask to safari to check something, and then come back to see my text obliterated. Because Spec junkies buy exclusively on it. As apple is focused on consumers first and foremost, RAM is something only "the nerds" find themselves concerned about, myself included. Apple does focus on specs, though--every year they talk about GPU and CPU performance. I would argue that RAM limitations are more impactful to a user's experience than processor speed. But I guess it's easier to communicate that "it's faster" than "2 GB means your apps will refresh less".